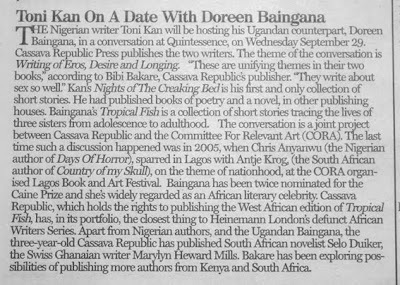 Nigeria's foremost literary critic saying nice things about CRP in last Sunday's Artsville column in the Guardian. Its good to get affirmation, though the road ahead is long and bound to include steep hills as well as the occasional beautiful vista. Taken from Cassava Republic's blog. wednesday the 29th? Please do you mean the 30th, 28th or tuesday?